I expected Tech to slowly lose potency leading up to the the Clemson game, but I was hoping that they’d be able to pull out big wins at UVA and Miami. 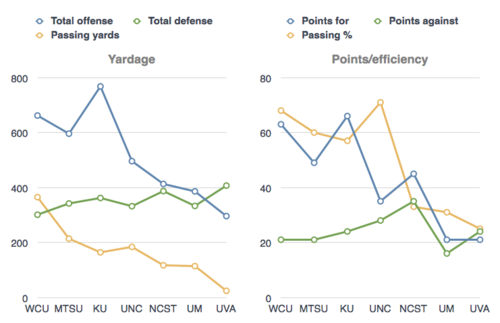 However, if you take a quick glance at the two charts below, you can get an idea of the statistical decline since the Kansas game. The Jackets have only had good success statistically against one team in that period, UNC. Washington completed 71% of his passes for 184 yards and Tech rolled up nearly 500 yards against one of the better ACC defenses. After that game, the drop has been dramatic, culminating in this week’s loss: 14 offensive points, 272 yards rushing and only 24 yards passing (at a 25% completion rate). It’s really impossible to really figure out if the decline was self-inflicted or due to increased competition, but I have a feeling that it’s a bit of both. Virginia has talent to be sure, and it’s hard to beat any team in their stadium – but let’s face it, GT has a better coaching staff and slightly better talent. However, the only game that I’d say was even close to a ‘complete game’ so far this year was the MTSU game, and that’s not really all that hard to do. Get the passing yards back up in the 50% range. I’ve been harping on this for weeks and it’s not getting any better, but at this rate last year’s passing stats are going to look downright impressive. The receivers are starting to drop passes, and that’s inexcusable. If the other team plays good coverage and breaks up a well-thrown ball, there’s no fault to be given there. But if Tevin Washington throws a halfway catchable ball and it hits a player’s hands, that needs to be a catch. Without a threat of a downfield passing game, it gets quite easy to overwhelm a one-dimensional offense, no matter the scheme. Clean up the run defense. Logan Walls is just getting bullied, as is the rest of the Tech offensive line, which is allowing the other team’s line to get to the second level and open up huge lanes for backs. If the Jackets can’t find a way to slow down the run this week, Jacory Harris is going to have a field day in the play action pass game. Stop making mental mistakes. Again, this is a coachable thing that the Jackets can fix. Huge penalties cost GT points in the second half and could have been the difference in the game. Tech is rarely going to be able to just show up and beat up on a team – they have to play smarter, faster and better than the other guys. Stupid penalties take away one of the only true advantages Tech has over any team. In a lot of ways, this game was a perfect storm of things that could work against the Jackets and credit the team for fighting back to tie the Cavs in the second quarter. However, they had no answer for the running game and I’m not sure they will for the rest of the season. Nobody thought Tech was going to go undefeated – I predicted an 8-3 record going into the bowl season and I still think 8 or 9 wins is about right for a young team that still has some holes that will be exposed against better competition coming up. However, there isn’t one game on the schedule that I say without a doubt Tech cannot win – but they have to get their act together and start playing smart, efficient football.